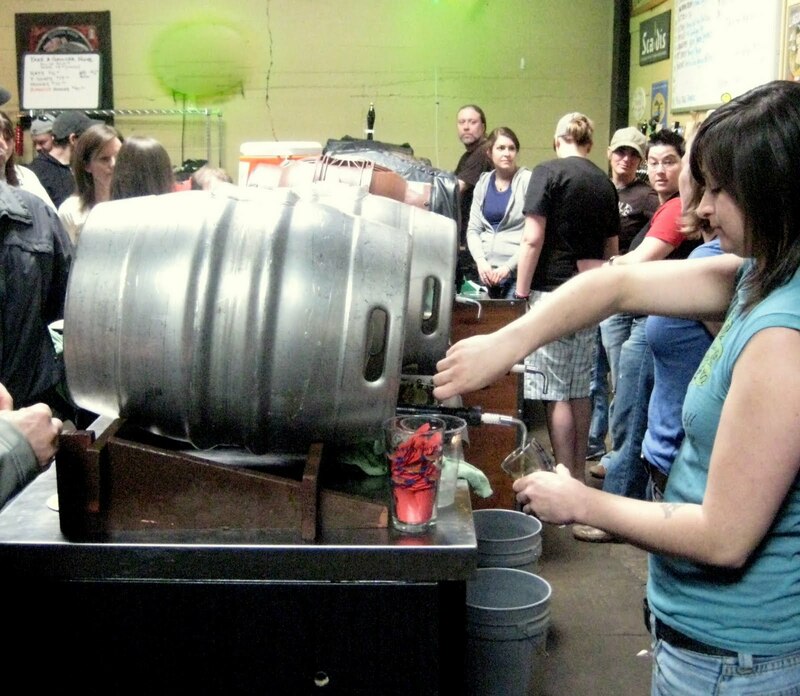 Saturday's Firkin Fest at the Green Dragon was something of a letdown. 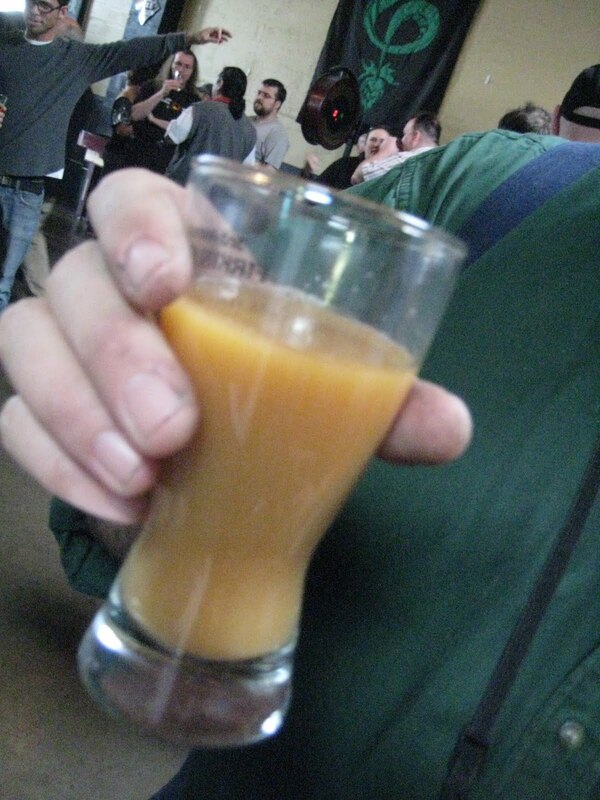 Writing about last year's Firkin Fest, I singled out four of the fifteen beers as especially noteworthy, those from Rock Bottom, Hopworks, Brewers Union, and Full Sail. This year, Rock Bottom and Full Sail didn't participate; Hopworks' offering had such a hellishly sulfurous taste that I dumped it; and the Brewers Union offering was solid but completely out of character for the cask-only brewery. The fest was supposed to have 20 different casks this year, but ended up with only 17 -- Full Sail, Calapooia, and Hop Valley were on the program but not at the fest. Oops, did I say "program"? I mean the list of participants posted online; actually there was no program handed out at the festival, and no list of beers printed anywhere. How hard could that be? At the Lucky Lab Barleywine Festivals, they often update the program as the event proceeds, to correct mistakes or last-minute changes. A simple printout of each brewery/beer/style would have been helpful, instead of having to wander around scanning the casks to remember which ale you wanted to try next. 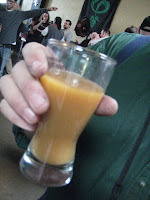 A further firkin fest failure this year was the tasting glass. Last year's was a giant tulip-shaped imperial pint glass, which I'm pretty sure holds about 22 ounces. This year's was a wee little thing, holding perhaps 8 ounces. My two favorites were two of the lower-alcohol, less-hoppy ales of the bunch: Twilight and Green Dragon's volunteer-brewed bitter. Maybe I came in with a preconceived bias that that's how cask ales should be, although by no means am I above drinking a cask double IPA if it sounds good. I did veer away from the ridiculous number of IPAs at this event, didn't even try the cask IPAs or hoppy reds from Lucky Lab, Oakshire, Eugene City Brewery, Double Mountain, or Laurelwood. Lompoc's dry-hopped C-Note tasted OK, but looked like a truck-stop cappuccino -- that's John's glass of C-Note in the picture above -- and I heard that Lucky Lab's Super Dog was similarly turbid. It would be nice if there was a way to let the casks settle for a reasonable amount of time before the beginning of the festival. Jeff Alworth also covered the fest at Beervana. Amen on the lack of any list/descriptions. Ridiculous. Before the event, it was impossible to find anything official. Twilight was great, but my favorite by a long shot was the Double Mountain. Oh and I am one of the few very satisfied customers with the food: two big dogs and kraut. Yum. Nice to have an excuse to eat badly. A couple comments. This year I persuaded the Dragon to let me set up, vent and tap all the firkins the night before. With the help of some OBG people and what I think was kitchen and bar staff we had all the casks up by midnight and tapped by 1:00. I had the privilege of driving back to the motel pleasantly coated in overzealous beer. I know this isn't enough time to properly settle, but the casks that were actually fined would've had at least a decent shot at it. This is in contrast to the previous festival in which they were tapped as little as a half hour before the door opened. Also, I know the beer I brought up wasn't a session beer, but I brew a range. I don't think it was out of character, just not what was expected. Nevertheless, the firkin was almost empty by the time I collected it Sunday morning. This weekend I'll brew a Welsh Mild to atone for it. @Patrick: Yeah, the hot dogs were a nice addition. I only regret that I fell for a cheese plate with my first ticket. @Ted: Good man! I was actually parroting your recommendation from last year when I suggested they set them up the night before. Turns out you're way ahead of me. I'm not surprised your firkin was emptied -- it was quite a tasty beer. Maybe "out of character" was a bad choice of words, but I'll bet it's a long time before you tap another Belgian Cascadian Dark.